In the last couple of years I have run across recipes that included Japanese yuzu kosho, but I didn’t know what it was. There were so many other recipes I wanted to make, so I just stuck those yuzu kosho recipes in a file and moved on. One day recently I was checking my files and realized I had a lot of yuzu kosho recipes, and it was time to find out what it was and cook something with it. I am so happy when I find a new ingredient that I have never cooked with before. 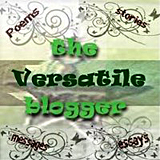 I love the hunt, either on-line or in my local markets. I shiver with anticipation the first time I open the container and take that first whiff. My mouth waters as I put a little spoonful on my tongue and experience that first revelatory taste. And then thinking about how that taste will be incorporated and enhance the rest of the recipe’s ingredients. So it was with yuzu kosho. First, finding it. I found green yuzu kosho at my local Japanese market, but not the red I needed. 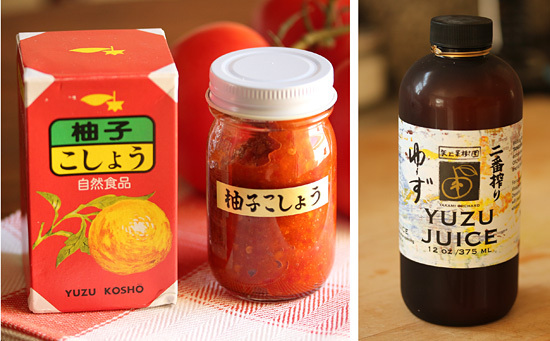 I found red and green yuzu kosho on Amazon and also the yuzu juice. Hooray! I had to wait impatiently for three…whole…days for it to be delivered. I opened the jar, put a little on my tongue and made that face when something is really salty. Getting past the saltiness, was red chile heat and a tart lime-orange-grapefruit zest component. Really different from anything I had tasted before. I could hardly wait to see how it tasted with the yuzu juice, minced green onions and soy sauce in the vinaigrette. If you would like to make DIY yuzu kosho, the ingredients are citrus zest (yuzu, lime, grapefruit), [red] jalapeno pepper and salt. For a good tutorial go here. I started out with huge scallops which were about 2-inches in diameter. I got them at Bristol Farms and was sure to find out if they were “dry”, which means not injected with water, chemicals or preservatives. It is hard to get them to brown properly when they are oozing wet additives. 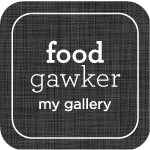 This recipe was adapted from Saveur. It was a grand experiment with yuzu kosho and I can hardly wait to make the next recipe. 1. Whisk together olive oil, yuzu juice, minced green onion, yuzu kosho and soy sauce in a bowl. 2. 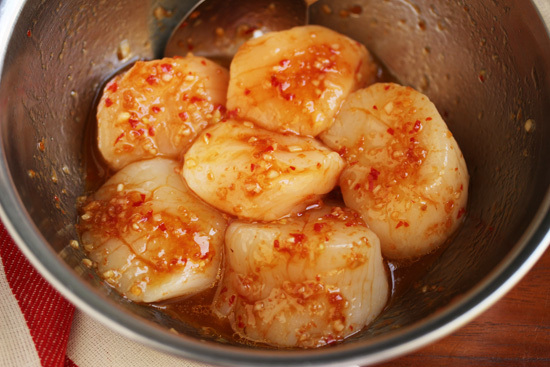 Put scallops in a second small bowl and add 1 ½ tablespoons yuzu vinaigrette. Toss to thoroughly coat. 3. Heat gas or charcoal grill to medium-high. 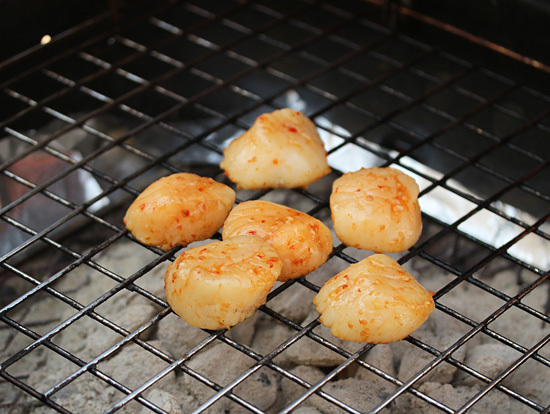 Grill scallops, turning once, until golden brown and just cooked through. 4. Transfer scallops to 2 warm serving plates and drizzle with reserved yuzu vinaigrette. Sprinkle with minced parsley and serve hot. 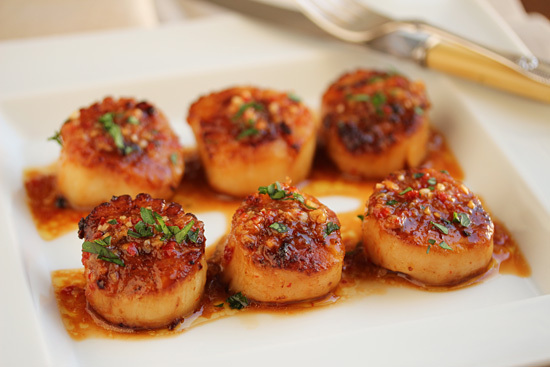 Note: Scallops may be cooked in a non-stick or cast iron skillet in 2 tablespoons of vegetable oil over medium-high heat. Sauté, turning once, until golden brown and just cooked through about 4 minutes total. OMG these sounds amazing. I love anything Japanese, thanks for sharing. 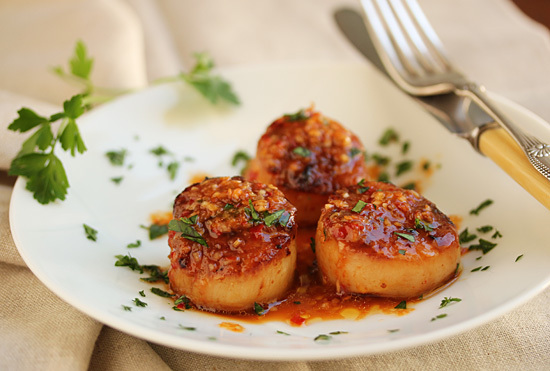 I am a big scallops fan, but I can never get them to brown properly–now I know why! Thank you so much, I’ll be looking for “dry” from now on. Also I need to try out this sauce, it looks amazing, and I love a good spicy Asian-inspired dish! I bought Yuzo marmalade at my local cheese shop and can’t get enough of it. Now I must try this one. I have no doubt it tastes as good as you make it look. Yowza you can yuzu! Those scallops look succulent! I sure hope they were dry because I bet you paid up the yuzu for them at BF. these sure look good…I haven’t purchased this stuff yet…although like you have seen it a lot….my side refrigerator door is busting with all sorts of trials of sauces, condiments…I need to just buy another Side Door Refrigerator!